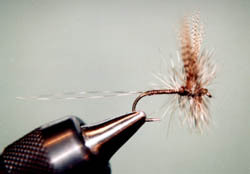 Fly Angler's OnLine "Fly of the Week #20"
Photo Copyright ©1998 James Birkholm. Any dry fly hook: 12, 14, 16, 18. Lemon wood duck, split and upright. Two stripped grizzly hackles, flared and tied extra long. Mixed dark ginger and grizzly. Attach thread near rear of hook. Fasten two stripped hackles, flaring each. Add a spot of head cement to the base of the tails and quill. Wind quill evenly forward to point for the wings and secure. Tie in wings pointing forward; tilt upright with thread wraps in front. Separate with figure eights. Tie in hackles behind wings, leave thread in front of wings. Wind hackles separately to front and tie off. I came across the Nearenuf early in my fly fishing life. It was just what I needed. At the time I was fishing the AuSable near Grayling, Michigan. My collection of books was just taking off and the fly would serve me well until I had figured out the stuff in the books. My casting was coming together and some knowledge of insects had started to sink in as well. The fly tying had also made some progress. I was a perfect candidate for the Nearenuf. It can be tied by a beginner. It will not look perfect. I guess it doesn't have to. It took trout the way I tied it. The current was fairly swift on the river and the temptation to fish a dry downstream was strong. I must admit to more than a time or two, of doing just that. I would fish slowly from the center of the stream, casting directly to the edge and throw a small upstream mend into the drift. This would allow the fly to ride somewhat properly for a few feet before it would sink into, or under the surface. I think what stands out most about the fly is that it gave me confidence that I had at least a fly that was pretty close to what ever was out there. I could concentrate on the fish, where to cast, reading the water, and catching trout. Eventually, I gave more time to 'upstream and dry' improving my success. I raised more trout and the hooking and landing ratio doubled.